In order to prepare for Term Four, I got learners to do a reflection on how they enjoyed their learning this term as well as ask some other questions to get insight into how they were finding my planning and instruction. 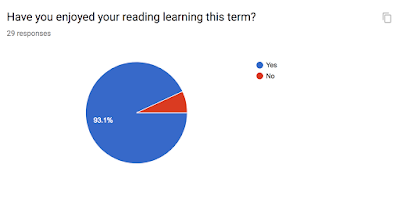 As these learners have been with me for the majority of the year now, I chose to add in a question about had they felt that they had made progress in their learning as I was interested to see what voice came back from them in this regard. 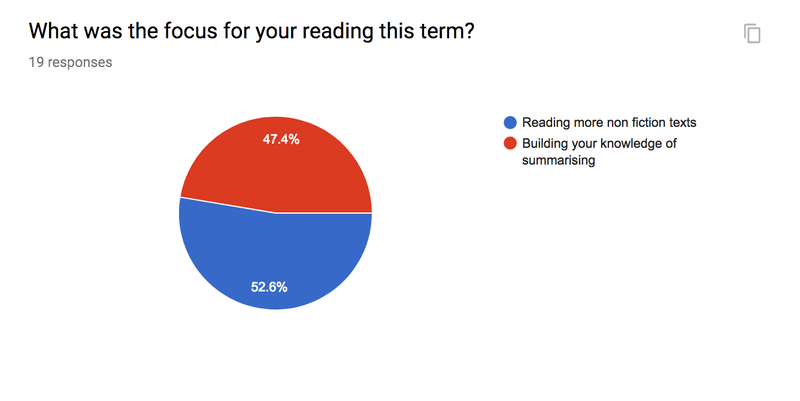 Having used Google Forms to capture this information, I have been able to analyse and graph their responses. 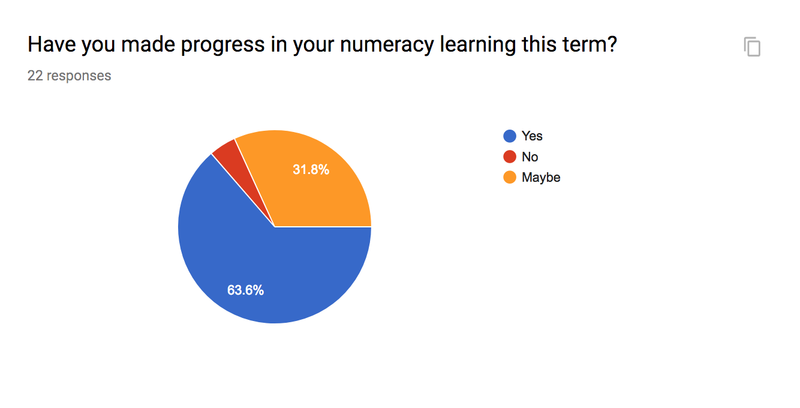 All these learners are now moving from Early Stage 5 to Stage 5 so it was great to see from their responses reflect some of the different areas that we were learning about this term. I chose to explore a more hands of approach with these learners where we problem solved together and share our ideas on a group modelling book which the learners enjoyed judging by this graph. 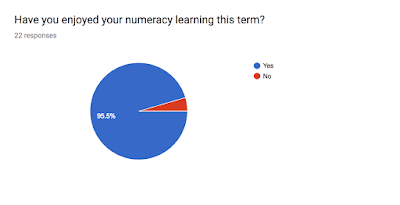 I also chose to dedicate one of our weekly sessions to building their confidence with strand maths as most of our learning had centred around either number knowledge or strategy. By making these lessons more hands on, the learners have been able to make progress in areas that historically I have left to the end of the term to go through and they have been able to make connections to other parts of their numeracy learning. However how did they rate their own progress? Reading through the responses, the majority of them talk about being able to work through 'harder' or 'bigger' strategies which rings true to how I introduced the bulk of the Stage 5 strategies to the groups. We would start with Stage 4 or Early Stage 5 strategy first and unpack that before making connections to the Stage 5 strategy. 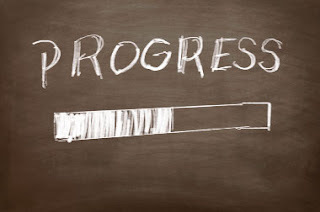 The one learner who felt that they did not make any progress is one that I have been tracking for confidence and their response reflects this. What was more awesome to read however was that they wanted to continue their learning and wanted more assistance (a 'workshop') to help them with this. 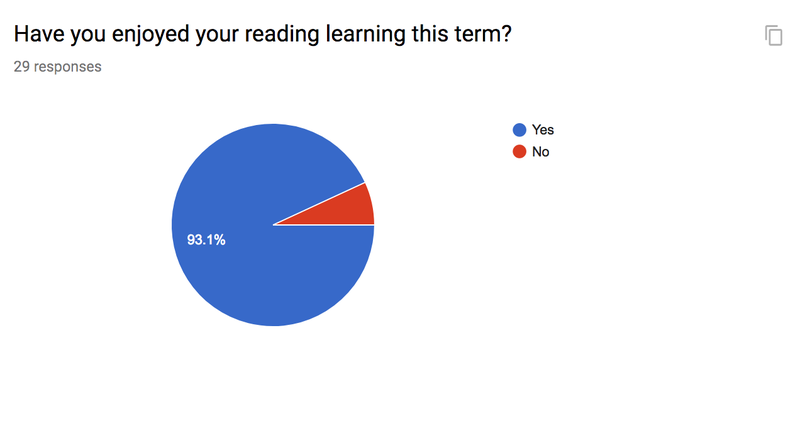 The two learners that said 'no' are ones that have recently moved to new reading levels and I have been working with them to manage any anxiety over the shift in focus. Having asked about their focuses for the term, it was great to see how some of these had come into their responses about making progress. I am currently looking at how learners self-report as part of my dissertation so am aware of any bias that may come from these responses however I am more happy to see that the learners are seeing themselves making progress.